American Chemist was edited by the Chandler Brothers. Edited by William H. Chandler and Charles Chandler. New York, 1870-1877. Professor William H. Chandler of Lehigh University co-edited (with his brother Charles Chandler, a well-known Chemistry professor at Columbia University) The American Chemist, a pioneering journal and a forerunner of the Journal of the American Chemical Society. The American Chemist provided an outlet for chemical research and kept American chemists informed on developments around the world. It covered the American chemists meeting at the Priestly Celebration in 1874 and the organizational meeting of the American Chemical Society in 1876. 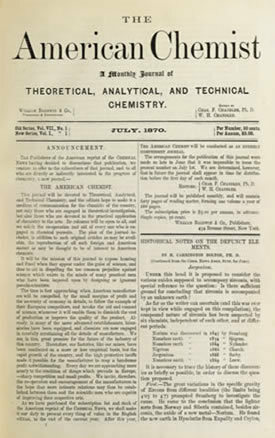 The American Chemist ceased its publication in 1877 and replaced by The Journal of American Chemical Society, the official journal of the society.